We are involved with many different groups; each event has unique demographics. I have spoken with utility employees, construction workers, residential contractors and environmentalists-all in six months! Fellows are encouraged to seek out people with opinions and backgrounds unfamiliar to us. I have encountered energy industry veterans as well as other young people. For example, at a dinner hosted by the Northeast Energy and Commerce Association (NECA) I was introduced to David O’Connor, former Commissioner of MA DOER. Only later that night did I find out that he was being honored for a lifetime achievement award in the industry! I also joined a group of clean energy young professionals who all work in Framingham. We established an email chain, and often look for opportunities to get together and build our careers. So far, my only overnight conference was a trip to Springfield, MA for the Home Performance Coalition (HPC) regional conference. I have been to New Haven, CT; Worcester, MA and Boston. Soon, I will attend a national conference in Nashville, TN. While in Springfield our staff shared dinner with the HPC staff. It was an excellent opportunity to connect beyond the superficial ties that can emerge during standard networking. I learned a lot about the different types of energy efficiency retrofits available and the difficulties contractors face while trying to effectively work with customers. 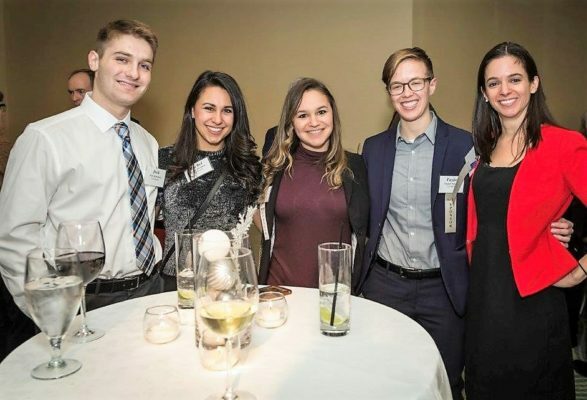 NECA’s annual holiday networking event had terrific live music, an outstanding dinner spread, and an atmosphere that perfectly balanced casual and classy. I also really enjoyed the NECEC Green Tie Gala. This formal evening celebrates clean energy industry progress in the Northeast each year. I heard fascinating speeches, including one by Rhode Island Governor Gina Raimondo. E4 had a table at the front of the room and it was a great night marked with excellent food, drinks, and green, climate themed accessories. The most significant change has been my ability to sincerely discuss and understand projects, both those I work on and other initiatives. Energy industry terms and acronyms take time to learn. Early on, I would often follow the “nod and smile” approach to networking. Now I am far more comfortable engaging with people. Getting more in-depth when talking about issues facing the industry feels satisfying and gives me confidence going forward.